Step 1 // Any content a user might wish to have posted in UNB Scholar is passed to either their designated liaison/subject librarian or directly to the Scholarly Communications librarian. Initially, ideal submissions will be basic citations or PDF files. Step 2 // A librarian will add your content to the repository. No matter what format of content being ingested, there will be a method to get it into the repository. They might submit an XML from RefWorks or a collection of publications from a spreadsheet or even just a ZIP file. We can ensure a method that best preserves metadata so your content is easily found and consistently cited. Eventually, any sort of material will have it’s own web form for submissions. 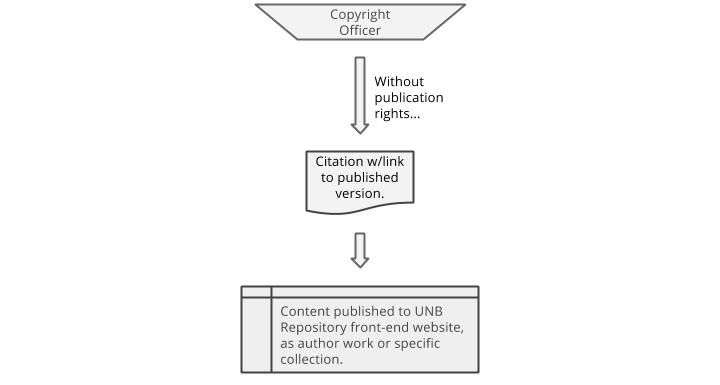 Step 3 // The content that goes into Scholar is placed in a Copyright Clearance Queue where UNB Libraries’ copyright officer and his staff use tools like SHERPA/RoMEO to determine the publication and sharing rights for all content. No content is made available without permission or clearance. Step 4 // If the copyright officer determines that a license allows for either publisher PDF or author’s post-print to be deposited in an Institutional Repository, those articles or files will be pushed to the website and publicly available. Step 5 // If the copyright officer determines that a license does not allow for either publisher PDF or author’s post-print to be deposited in an Institutional Repository, those articles will be listed only as citations and with links to the publisher copy.